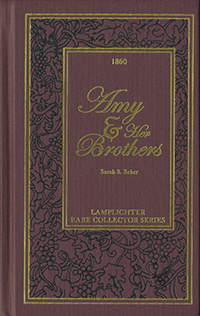 Amy and Her Brothers is part of the Fireside Collection. The heartache and innocent faith of an orphan child paints a real-life picture of the hidden suffering all around us, challenging us to be more attentive to the hurts of those nearby. The heart of the story, however, lies in the incredible relationship between a younger brother and sister, and the love and forgiveness shown toward their selfish and greedy older brother. This is a story of redemption that brings tears of joy.